A Year In The Saddle: Kajsa Tylen and the Women’s Distance Record. It’s just after 3pm on a Tuesday afternoon in Hackney and Richard Moore, Lionel Birnie and Daniel Friebe are looking for a bit of peace and quiet. The trouble is that around the busy East London streets of Broadway Market and London Fields school kids are heaving out onto the hot pavements and the nearby building sites that are sprouting up yet more flats in this trendy part of the capital are still in full swing. Add in the chatter of the many achingly cool characters lounging outside myriad cafés and coffee shops and, despite the lovely summer afternoon weather, things are looking, and most definitely sounding, pretty bleak. 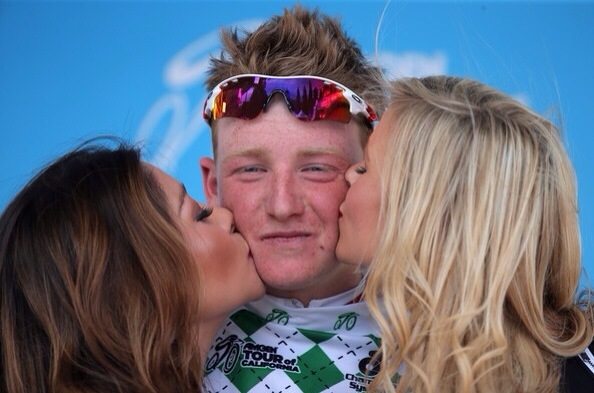 Nineteen year old British rider Tao Geoghegan-Hart experienced both the highs and lows of the top level of peloton life in the recent Tour of California. The Hackney-born neo-pro, riding his first season with Axel Merckx’s Bissell Development Team, found himself 4th on General Classification on Stage 1 after getting into the day’s successful break and gaining time bonuses at the intermediate sprints. A trip to the podium also followed to pick up the Best Young Rider jersey. Throughout the week the Bissell riders were road-testing SRAM’s new wireless shifting group set offering an additional opportunity for Tao to talk with an understandably excited press, but the youngster’s week ended in less than ideal fashion with a bad crash that left him 14 minutes down on the day and with a large amount of road-rash that made his journey back to the UK very uncomfortable. I asked him questions on the day he took his family to watch a bit of sun-soaked cycle action at the London Nocturne event around Smithfield. 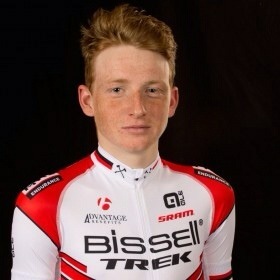 TJP: The Bissell team really took the race on in California recently. What were the teams plans before the race? TGH: Simply to get stuck in and show ourselves to the bigger teams as much as possible. I was the youngest rider, but some of the other guys are in their last or second to last year as U23’s, so it is important they show themselves at any opportunity. Obviously it is a 2.HC race stacked with WorldTour opposition, so you take your chances where you can. You got the young rider jersey and 4th on GC after stage 1. How did that feel? It was an opportunistic move, but like I say, as a smaller development team, we have to go for every bit of exposure and result, however big or small, that we can. It was good to get the team off on the right foot, even if we eventually did have some troubles later in the week with crashes and injuries. The Young Rider jersey on Stage 1 at the 2014 Tour of California. Is this the first time you’ve raced with the likes of Wiggins, Cav, Sagan etc? Yes, although I have trained with quite a few of the guys I was racing with at one time or another, so it wasn’t all completely new. Did the race feel different because of their presence? No, a bike race is a bike race, once you are in it it doesn’t matter who you are racing, there isn’t time for that. Of course it is special having such a high caliber field lining up but in order to race, I think it is important to remove any thoughts of the opposition, who they are, what they might have achieved, from your mind. It certainly elevates the profile of the race though. Tao has featured prominently in the junior events which he has been competing in until now. His 3rd place finish in Junior Paris-Roubaix in 2013 was followed up by stage and GC wins in the Tour d’Istrie and the Giro Dell Lungiana. Another podium finish in this year’s U23 Liege-Bastogne-Liege shows his strength is still good at this new level. Touted by cycling writer Daniel Friebe as a ‘future winner of the Tour de France’ Tao will be closely watched by many in the sport as he continues to develop. You must have spoken with a few different teams before signing with Bissell. What helped you make the decision to race with them? Racing under Axel was a huge draw, combined with the team’s history of placing riders into the World Tour and on to great careers. ‘Development’ is the most important thing in this team and I value that above all else. Although I must add we have some great sponsors too, which always helps. How has living abroad and the increased travel been for you? Are you missing London and your family? I miss my family of course but it is part of the job and I wouldn’t have it any other way. I love being abroad and I don’t think it should be taken for granted to be able to visit new places and see the world. I don’t mind living abroad or travelling, like I say, it is all part of the fun and draw of the sport. You got to test some special equipment at the Tour of California. Were SRAM looking for feedback from you as well as the testing in a race environment? Yes we went through an extensive feedback process with SRAM, looking at every angle and detail in which we may be able to improve the groupset for racers and amateur riders alike. It is a fascinating product and it was a real honour to be able to work with and on it. 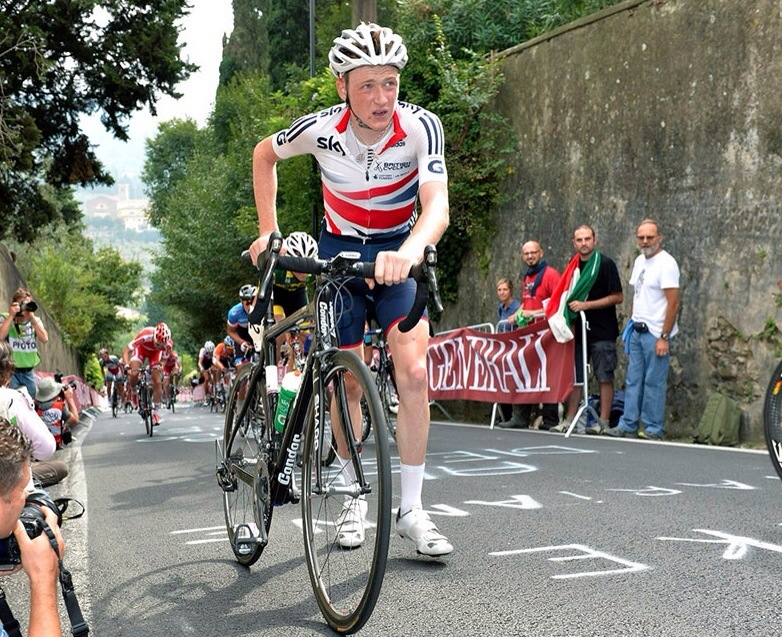 At the Junior World Road Race last year Tao was let down by an equipment failure on a crucial climb. What has surprised you most about the pro ranks? It wasn’t a surprise, but the races are much more controlled than at the Junior level and even U23’s in some ways. There is a clearer hierarchy and a great deal of respect between the riders that there is not at the lower levels. Tell us about your plans for the next few months. My race calendar has yet to be announced and is largely dependent on selections, but I hope to have a strong finish to the year in August and September on both sides of the Atlantic. My main aim is to return to the form I had in the Spring and do a good job for the team, on whatever level that may turn out to be.